For our next selection we go back to the National Hockey League with the Calder Trophy, which is awarded annually to the league’s top rookie. Does being a top rookie put you in line for the Hockey Hall of Fame? The following are the past players who have won the Calder Trophy in the NHL who are eligible for the Hockey Hall of Fame and have been enshrined. 16 Goals, 29 Assists, 45 Points, 6.1 Point Shares. This is off to an excellent start at Syl Apps would lead the National Hockey League in Assists as a Rookie and he built on that to be named a post season All Star five times. More importantly for Apps and the Maple Leafs he would help them win three Stanley Cups and he would retire as a Point per Game player. Inducted into the Hall of Fame in 1961. 33 Wins, 9 Losses 1 Tie, 1.56 GAA, 11.3 Goalie Point Shares. Very few players had a start to their career like Frank Brimsek as not only was the Calder Trophy winner, he also was the Vezina Trophy winner, a First Team All Star and he took the Boston Bruins to the Stanley Cup. The native of Eveleth, Minnesota would lead the Bruins to another Cup win in 1941 and he was also a Vezina Trophy winner in 1942. Inducted into the Hall of Fame in 1966. 15 Goals, 19 Assists 34 Points, 2.9 Point Shares. Edgar Laprade played his entire career with the New York Rangers and he would finish third in Lady Byng balloting that year. He would win the Lady Byng in the 1949/50 season. Inducted into the Hall of Fame in 1993. 44 Wins, 13 Losses 13 Ties, 1.56 GAA, 17.0 Goalie Point Shares. In what would be a huge opening year, Terry Sawchuk would lead the National Hockey League in Goalie Point Shares and was also a First Team All Star. Sawchuk was the leader in Wins his year and would be the next four seasons. Inducted into the Hall of Fame in 1971. 30 Goals, 24 Assists 54 Points, 7.0 Point Shares. The future Hockey Hall of Famer would lead the NHL in Power-Play Goals. 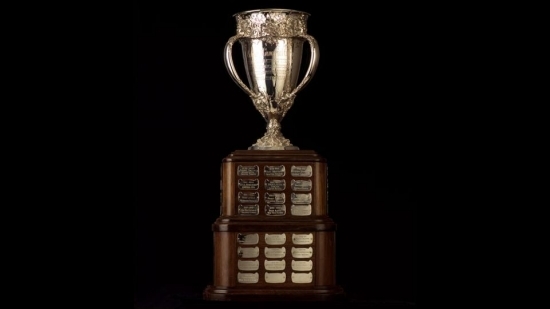 The future Hart Trophy winner would win six Stanley Cups with a Hart and Art Ross Trophy win in 1961. Inducted into the Hall of Fame in 1972. 13 Wins, 29 Losses 8 Ties, 3.02 GAA, 4.4 Goalie Point Shares. The “Gump” would lose way more games than he won in this season (16) and this would be a theme for Worsley but he gave it everything he always had, which was why he would enter the Hockey Hall of Fame and would win two Vezina Trophies. Inducted into the Hall of Fame in 1971. 30 Wins, 24 Losses 16 Ties, 2.10 GAA, 14.5 Goalie Point Shares. As a rookie, Glenn Hall was not only the Calder Trophy winner but was a Second Team All Star and the leader in Shutouts and Minutes Played and a second place finish in Point Shares. Hall would later be a multi time post season All Star and was a first ballot Hall of Famer. Inducted into the Hall of Fame in 1975. 20 Goals, 16 Assists 37 Points, 3.3 Point Shares. The “Big M” had a. good rookie season but he would later become a six time Stanley Cup winner and also a nine time post season All Star. Inducted into the Hall of Fame in 1972. 20 Goals, 25 Assists 45 Points, 4.2 Point Shares. With the Toronto Maple Leafs for most of his career, Dave Keon would later be a two time Lady Byng Trophy winner and was the Conn Smythe Trophy winner for the last Toronto Maple Leaf Stanley Cup Championship team. Inducted into the Hall of Fame in 1986. 2 Goals, 28 Assists, 30 Points, 6.7 Point Shares. Laperriere was another great Quebecer to play for his home province team where he was immediately one of the better Defenseman in the NHL. Playing for the Montreal Canadiens his entire career be was a Second Team All Star as a rookie and would be a First Team All Star the next two seasons after, which included a Norris Trophy win in 1966. Laperriere would help the Habs win five Stanley Cups. Inducted into the Hall of Fame in 1987. 13 Goals, 28 Assists, 41 Points, 6.0 Point Shares. Any chance we have here to talk about Bobby Orr is always a blessing to us! Orr is without question the greatest Defenseman that ever lived and some will go as far to say is the best hockey player period. As a rookie, the Boston Bruin was a member of the Second Team All Star roster. Orr finished third in Norris Trophy voting but would go on to win the next eight. He was such a great player that he was inducted into the Hockey Hall of Fame without the mandatory three year wait. Inducted into the Hall of Fame in 1979. 38 Wins, 17 Losses 8 Ties, 2.17 GAA, 14.7 Goalie Point Shares. This would be an incredible career for Tony Esposito who as a rookie would not only win the Calder but the Vezina Trophy First Team NHL and was the league leader in Wins and Save Percentage. He would win the Vezina two more times. Inducted into the Hall of Fame in 1988. 38 Goals, 34 Assists, 72 Points, 6.5 Point Shares. One of the greatest Buffalo Sabres of all time, Gilbert Perreault played his entire career in Western New York. The Quebecer would later be named a Second Team All Star on two occasions and a later Lady Byng Trophy winner. Inducted into the Hall of Fame in 1990. 38 Wins, 8 Losses 15 Ties, 2.24 GAA, 15.0 Goalie Point Shares. In terms of a brief career, there is nobody in any team sport that equals that if Ken Dryden. Prior to winning the Calder, Ken Dryden would win the Stanley Cup and Conn Smythe, which made him more successful than any other Calder Trophy winner. Dryden would later win four Vezina Trophy wins and would hoist the Stanley Cup five more times. Long story short, Ken Dryden was the best NHL Goalie of the 1970’s. Inducted into the Hall of Fame in 1983. 17 Goals, 37 Assists, 54 Points, 6.5 Point Shares. Denis Potvin was the first piece in what would eventually become the New York Islanders dynasty that would win four Stanley Cups in the 1980’s. Potvin anchored the Islanders blueline where he would win three Norris Trophies and was a five time First Team All Star. Inducted into the Hall of Fame in 1991. 32 Goals, 63 Assists, 95 Points, 8.6 Point Shares. See above! With the Denis Potvin entry we talked about him being the building block for the Islanders dynasty. Here was the next massive piece of the puzzle was Bryan Trottier who was eighth in the NHL in Assists as a Rookie and had an excellent finish of 95 Points. Trottier would later win the Hart Trophy (1979), was a four time post season All Star and in addition to the four Stanley Cups he won with the Islanders, he would help the Pittsburgh Penguins two Cups in the early 1990’s. Inducted into the Hall of Fame in 1997. 53 Goals, 38 Assists, 91 Points, 10.3 Point Shares. See above! Again! Potvin. Trottier. Mike Bossy. Three Calder trophy winners in five years and all three Hall of Famers resulting in four Stanley Cups. As a rookie, Mike Bossy scored 53 Goals and was second in that metric. With the exception of his final season he never had a year where he dipped below 50. A Second Team All Star as a Rookie, Bossy would later be a First Team All Star five times. His excellent career ended early at the age of 30 due to back issues. Inducted into the Hall of Fame in 1991. 17 Goals, 48 Assists, 65 Points, 10.3 Point Shares. When you had Bobby Orr, how lucky are you as an organization to land Ray Bourque? The Boston Bruins Defenseman was a First Team All Star as a rookie and he would be named to either a First or Second Team All Star every year after until the 1996/97 season. Bourque would later win the Norris Trophy five times. Inducted into the Hall of Fame in 2004. 39 Goals, 70 Assists, 109 Points, 8.6 Point Shares. While some might point to Stastny’s age (24) and that he had already been playing in his native Czechoslovakia for a while to paint this Calder win as tainted, this was a huge deal as Stastny had already established himself as the best player on the Czechoslovakian team and his defection (along with his brother Anton) ushered in others from the Iron Curtain to do the same. As an NHL rookie, he scored 109 Points and would have five more 100 Point seasons. Inducted into the Hall of Fame in 1998. 45 Goals, 58 Assists, 103 Points, 7.9 Point Shares. Scoring 103 Points as a rookie, Hawerchuk would later be a Second Team All Star and runner-up for the Hart Trophy in the 1984/85 season. He would score 1,409 Points over his National Hockey League career. Inducted into the Hall of Fame in 2001. 43 Goals, 57 Assists, 100 Points, 7.9 Point Shares. With a 100 Point season as a rookie, Mario Lemieux was just getting started. He would win the Hart Trophy three times, the Art Ross six times, was a post season NHL All Star nine times and took the Pittsburgh Penguins to a Stanley Cup win in 1991 and 1992. He would become the player to rival Wayne Gretzky. Lemieux retired in 1997 but returned in 2000 as a player owner and retired again in 2006. Lemieux would later win three more Stanley Cups as an owner and is the only man in history to have his name etched on the Cup as a player and as an owner. Had the Penguins never drafted him there is a very good chance that Pittsburgh would not have an NHL team today. He was inducted immediately after his first retirement and he would become the first player to win the Calder, was inducted into the Hockey Hall of Fame and return to action. Inducted into the Hall of Fame in 1997. 45 Goals, 39 Assists, 84 Points, 6.8 Point Shares. In addition to winning the Calder, Luc Robitaille would be named a Second Team All Star. This was just the beginning for a great career that was spent predominantly with Los Angeles and he would be named a First Team All Star five times and a Second Team All Star three times. He retired with 1,394 Points and he entered the Hockey Hall of Fame in his first year of eligibility. Inducted into the Hall of Fame in 2006. 51 Goals, 41 Assists, 92 Points, 8.7 Point Shares. Nieuwendyk would lead the NHL in Power Play Goals as a rookie and later in his career would win the Stanley Cup with three different teams; 1989 with Calgary, 1999 with Dallas (where he won the Conn Smythe) and 2003 with New Jersey. He finished his career with 1,126 Points. Inducted into the Hall of Fame in 2011. 23 Goals, 48 Assists, 71 Points, 9.0 Point Shares. Brian Leetch had an exceptional career in the NHL and securing the Calder Trophy was just the beginning. Leetch played for the Rangers most of his career where he would win the Norris Trophy twice and lead his team to win the Stanley Cup in 1994 where he was named the Conn Smythe Trophy winner. He scored 1,028 Points and entered the Hall of Fame in his first year of eligibility. Inducted into the Hall of Fame in 2011. 24 Goals, 62 Assists, 86 Points, 6.8 Point Shares. This is the most controversial Calder Trophy winner as Makarov was over 30, but this was in fact his professional season as he played for the Soviet Union and was a star for the Red Army throughout the 1980’s and through Canada Cups and other small tournaments he had played against the NHL’s best many times. Still, by the definition of what a rookie is, he qualified though he entered the Hockey Hall of Fame more on what he did Internationally. Inducted into the Hall of Fame in 2016. 43 Wins, 19 Losses 7 Ties, 2.47 GAA, 14.0 Goalie Point Shares. Ed Belfour had many excellent seasons in the National Hockey League and the argument can certainly be made that this was his best one. Belfour won the Vezina and William M. Jennings trophy and was the leader in Goals Against Average, Save Percentage and Minutes Played. Belfour would later earn his second Vezina as a Blackhawk two years later, and he was also a William M. Jennings Trophy winner three more times. More importantly, “Eddie the Eagle” would backstop the Dallas Stars to a Stanley Cup win in 1999. Inducted into the Hall of Fame in 2011. 34 Goals, 26 Assists, 60 Points, 6.8 Point Shares. This was a good season for “The Russian Rocket” but he would later have five 50 Goal Seasons, two of which would see him net 60. Bure a First Team All Star with the Canucks and later for the Florida Panthers would have back-to-back Second Team All Star Selections and Maurice Richard Trophy wins as the NHL’s leading Goal Scorer. Inducted into the Hall of Fame in 2016. 76 Goals, 56 Assists, 132 Points, 13.4 Point Shares. Wow!!! First off Selanne was the first player from Finland to win the Calder but there is so much more here. Selanne scored 76 Goals and 132 Points, both of which are by the far most of any rookie and Calder winner. Considering the current landscape, this could be untouchable. Selanne would score the most goals this year but this would be his best season by far of his career though “The Finnish Flash” was no flash in the pan (sorry, couldn’t resist). Selanne would have three more 100 Point seasons and would play into his early 40’s and scored 1,457 Points over his career. He would win a Stanley Cup with the Ducks and was a first ballot Hall of Famer. Inducted into the Hall of Fame in 2017. 27 Wins, 11 Losses, 8 Ties, 8.9 Point Shares. Martin Brodeur is one of the most successful Goalies of all-time and save for seven games with the St. Louis Blues it was done with the Devils. Brodeur had a good rookie year but unlike other Calder winners who were Goalies, Brodeur’s Calder year was not even in his top ten. Brodeur would later win four Vezina Trophies, five William M. Jennings Trophies and four Stanley Cups. He is the all time leader in Wins, Saves, Games Played (by a Goalie) and Minutes Played and that may not change in 50 years. Inducted into the Hall of Fame in 2018. 15 Goals, 35 Assists, 50 Points, 8.2 Point Shares. When the Philadelphia Flyers traded for Eric Lindros there was piece of the puzzle that was an unknown factor. That was the rights to Peter Forsberg, who would turn out (we think) to best player in the deal. The Swedish star would later help the Colorado Avalanche win two Stanley Cups and for his own trophy case the Hart Trophy and Art Ross in 2002/03. He would also be a three First Team All Star. Inducted into the Hall of Fame in 2014. 10 Goals, 9 Assists, 19 Points, 1.3 Point Shares. Dahlstrom would have better seasons in the National Hockey League but he would never have a season that could be considered great. He would however win the Stanley Cup as a rookie with the Blackhawks and his 206 Points in 345 Games were perfectly decent. Unranked on Notinhalloffame.com. 15 Goals, 13 Assists, 28 Points, 3.8 Point Shares. This would be the best season of Kilby MacDonals’s brief career as he would bounce back and forth between the Rangers and the minors after. MacDonald who also won a Stanley Cup with the Rangers this year also served in the Army in between stints in professional hockey. Unranked on Notinhalloffame.com. 18 Goals, 16 Assists, 34 Points, 3.8 Point Shares. This was by far and away the best season of John Quilty’s career and after another season for the Montreal Canadiens he would join the Canadian military. Quilty would later return but did not do much and retired with only 81 Points in 125 NHL Games. Unranked on Notinhalloffame.com. 16 Goals, 17 Assists, 33 Points, 3.0 Point Shares. Warwick would play for nine seasons in the NHL and peaked with 42 Points in the 1944/45 Season. He would play most of his career with the New York Rangers with two seasons with Boston and a year with Montreal following. Unranked on Notinhalloffame.com. 24 Goals, 23 Assists, 47 Points, 4.0 Point Shares. The Calder Trophy win for Gaye Stewart had so much historical meaning. The first is that he would become the first player to win the Calder after he won the Stanley Cup as he played for the Maple Leafs in three games in the 1942 Playoffs. Like so many, Stewart’s career took on a sabbatical as he joined the Royal Canadian Navy during World War II but he returned in the 1945/46 Season to lead the National Hockey League in Goals and he was the runner-up for the Hart Trophy and the year after he helped Toronto win the 1947 Stanley Cup. He was traded the following season to Chicago and was a Second Team All Star that season. He finished his career with 344 Points in 502 Games. Unranked on Notinhalloffame.com. 22 Goals, 40 Assists, 62 Points, 4.5 Point Shares. Bodnar’s 62 Points was the best of his career and that was likely because it occurred in the depleted talent pool that was the World War II NHL. Bodnar’s career was not Hall of Fame worthy but it was a good one that spanned 12 years long and he would win two Stanley Cups with Toronto in 1945 and 1947. Unranked on Notinhalloffame.com. 24 Wins, 22 Losses 4 Ties, 3.22 GAA, 10.1 Goalie Point Shares. Frank McCool had a very interesting and brief career. The Goalie played hockey at Gonzaga and would join the Canadian Military to serve in World War II. He would return to hockey and this time it was at the professional level where he would serve between the pipes for the Toronto Maple Leafs and take them to the Finals and win the Cup. In the process he recorded four Shutouts in the post season and three straight, which still is tied for the record today. So what did Frank McCool do for an encore? Nothing really. He would play 22 more games for the Leafs and retire shortly after due to ulcers. Unranked on Notinhalloffame.com. 27 Goals, 18 Assists, 45 Points, 4.5 Point Shares. The first season of Howie Meeker’s career was arguably his finest as he had career highs with 27 Goals and 45 Points as a rookie and would help the Toronto Maple Leafs win the Stanley Cup. Meeker would win two more Stanley Cups with Toronto and retired with 185 Points in 346 Games. Meeker would later become more famous as a broadcaster. Unranked on Notinhalloffame.com. 24 Goals, 24 Assists, 48 Points, 5.7 Point Shares. In terms of traditional statistics, Jim McFadden’s best season was his rookie year where he had career highs in Goals, Assists and Points. McFadden’s career was not a long one as it lasted seven seasons, four with Detroit and three with Chicago. His last season in Motown would see him win the Stanley Cup. Unranked on Notinhalloffame.com. 14 Goals, 16 Assists, 30 Points, 2.6 Point Shares. This was the best season of Lund’s career where he had career highs in Points and would become the first European born to win the Calder. Lund was born in Finland, although arrived in Canada at the age of six. The Forward would last five years in the NHL. Unranked on Notinhalloffame.com. 22 Wins, 30 Losses, 15 Ties, 3.28 GAA, 7.3 Point Shares. Jack Gelineau may have had a losing record but he was a machine in terms of work load. The Boston Bruin was fifth in Goalie Point Shares this season and he was third in the season after but his overall career ended shortly after. Unranked on Notinhalloffame.com. 24 Goals, 15 Assists, 39 Points, 5.4 Point Shares. Camille Henry’s rookie season would see him lead the National Hockey League in Power Play Goals (20). Henry would regress and would bounce around in the AHL but would return wo have a Second Team All Star and Lady Byng winning season in 1957/58. Henry would finish in the top five in Lady Byng voting five more times and would also finish first in Power Play Goals two more times and he would retire with 528 Points in 727 Games. Unranked on Notinhalloffame.com. 23 Goals, 28 Assists, 51 Points, 5.8 Point Shares. According to the story, the Montreal Canadiens “gifted” Litzenberger in a trade to the Chicago Blackhawks in an attempt to keep the team viable in the NHL; basically so that they would not go under! He would score 51 Points as a rookie and would later be a Second Team All Star in 1957 where he was sixth in Hart Trophy voting. He retired with 416 Points in 619 Games. Unranked on Notinhalloffame.com. 14 Goals, 19 Assists, 33 Points, 2.8 Point Shares. With all due respect to Larry Regan, he had a pedestrian career in professional hockey and he did nothing more than what you saw in this season. The forward would only score 136 Points over his career in the NHL Unranked on Notinhalloffame.com. 18 Goals, 22 Assists, 40 Points, 3.8 Point Shares. Ralph Backstrom would win six Stanley Cup Rings with the Montreal Canadiens and was also a six time All Star. Ranked #34 on Notinhalloffame.com. 18 Goals, 37 Assists, 50 Points, 4.9 Point Shares. Bill Hay played all of his eight seasons in the NHL with the Chicago Blackhawks where he would win a Stanley Cup and a Calder, but this would be the only awards he would win. Unranked on Notinhalloffame.com. 21 Goals, 24 Assists, 45 Points, 4.3 Point Shares. Rousseau would lead the NHL in Short-Handed Goals and he would later help the Montreal Canadiens win four Stanley Cups in the 1960’s. In the 1965/66 season he would lead the NHL in Assists and was named a Second Team All Star. He would score 703 Points over his career. Unranked on Notinhalloffame.com. 7 Goals, 15 Assists, 22 Points, 6.6 Point Shares. While Kent Douglas would have better individual stats in later years, his first season in the NHL was a special one as he not only won the Calder but was a member of the Toronto Maple Leafs’ 1963 Stanley Cup win. Unranked on Notinhalloffame.com. 40 Wins, 22 Losses, 7 Ties, 2.42 GAA, 14.4 Point Shares. The rookie season of Roger Crozier was also the best of his career as he was the league leader in Wins, Saves, Shutouts and Minutes Played while also being named a First Team All Star. Crozier was named the Conn Smythe winner the next year but he never had a season like this again though is still a 200 Game winner. Unranked on Notinhalloffame.com. 14 Goals, 13 Assists, 27 Points, 2.0 Point Shares. Considering that he was a Calder Trophy winner, Brit Selby did not have a great career as he would be sent down to the minors the year after and never had a season higher than 30 Points. He isn’t the worst player to win the Calder but is in the top ten. Unranked on Notinhalloffame.com. 24 Goals, 25 Assists, 49 Points, 4.8 Point Shares. Many books can be written on the career of Derek Sanderson but for this purpose we have an exciting Calder Trophy winner who had the tiger by the tail. Sanderson would later win the Stanley Cup twice with the Boston Bruins but would never win another individual accolade again. Unranked on Notinhalloffame.com. 34 Goals, 31 Assists, 65 Points, 6.8 Point Shares. Danny Grant had an understated career which was spent predominantly with the Minnesota North Stars and Detroit Red Wings. Grant would have four 60 Point Seasons, this being the first of them, but overall it was not one that warranted serious Hall of Fame consideration. Unranked on Notinhalloffame.com. 30 Goals, 23 Assists, 53 Points, 5.9 Point Shares. Steve Vickers made history as the first rookie to score consecutive hat tricks and he would overall put the puck in the net 30 times in his Calder Trophy winning season. Vickers would later be named a Second Team All Star two season later with a 41 Goal year but by age 30 he was out of the NHL after his play dropped off considerably. Unranked on Notinhalloffame.com. 39 Goals, 21 Assists, 60 Points, 6.1 Point Shares. Eric Vail’s best goal scoring season was as a rookie (39) and he would become the first player in Flames franchise history to win the Calder. Vail would have two more 30 Goal seasons and when the team moved to Calgary he was the leading goal scorer in franchise history. Unranked on Notinhalloffame.com. 33 Goals, 23 Assists, 56 Points, 6.1 Point Shares. This was the second Calder trophy in three years for the Atlanta Flames but unlike the Islanders who had the same earlier with Potvin and Trottier, Eric Vail and Willi Plett were not in that league. Still, Plett had 33 Goals as a rookie and would have another 30 goal season when he scored 38 the year the Flames moved to Calgary. This would be the only individual award that Plett would win the NHL. Unranked on Notinhalloffame.com. 30 Goals, 44 Assists, 74 Points, 6.1 Point Shares. Bobby Smith had a really good career where he would score 1,036 Points and would be a four time All Star. His best individual seasons were with the Minnesota North Stars but he would later win the Stanley Cup with the Montreal Canadiens in 1986. Ranked #22 on Notinhalloffame.com. 43 Goals, 47 Assists, 90 Points, 8.4 Point Shares. Steve Larmer was a Point per Game player in the National Hockey League, which was very good for the 1980’s but not what it means today. Larmer would go to two All Star Games and late in his career he would assist the New York Rangers would win the Stanley Cup. Ranked #32 on Notinhalloffame.com. 26 Wins, 12 Losses, 3 Ties, 2.85 GAA, 7.5 Point Shares. Tom Barrasso would have a very long career in the National Hockey League (19 years) but like other Calder winning Goalies his best season professionally was as a rookie. He would not only win the Calder but was a First Team All Star and would win the Vezina. Barrasso would later win the William M. Jennings Trophy and two Second Team All Star nods and overall won 369 Games in the NHL. Ranked #12 on Notinhalloffame.com. 18 Goals, 50 Assists, 68 Points, 8.0 Point Shares. Gary Suter would score well for a Defenseman and in his third season he scored 91 Points en route to a third place finish in Norris Trophy voting and a Second Team All Star Selection. Suter would help the Flames win the Stanley Cup the year after and overall would score 844 Points in his NHL career. Ranked #27 on Notinhalloffame.com. 26 Goals, 35 Assists, 61 Points, 5.3 Point Shares. Daniel Alfredsson was the second straight Swedish player to win the Calder (following Peter Forsberg) and the Ottawa Senator would go on to lead the team to what is their greatest success to date. The greatest player in franchise history would score 1,157 Points and was named a Second Team All Star in 2005/06. Ranked #4 on Notinhalloffame.com. 20 Goals, 24 Assists, 44 Points, 5.0 Point Shares. Drury would go on to have a solid career where he helped the Avalanche win the Stanley Cup in 2001. He would later blossom into a strong defensive forward and for five years in a row (2005-06 to 2009-10) he would receive votes for the Frank J. Selke. Unranked on Notinhalloffame.com. 19 Goals, 51 Assists, 70 Points, 7.3 Point Shares. From the great state of Alaska, Scott Gomez scored 70 Points as a rookie and would hit that mark three more times. Gomez helped the Devils win the Stanley Cup as a rookie and again in 2003 and he would be a two time All Star. He scored 756 Points over his career. Unranked on Notinhalloffame.com. 32 Wins, 21 Losses, 7 Ties, 11.7 Point Shares. Evgeni Nabokov finished fourth in Vezina Trophy as a rookie, and would finish in the top six five more times. He would also be a First Team All Star in 2007/08 when he led the Goalies in Wins. He would have a career record of 353-227-86. Ranked #124 on Notinhalloffame.com. 26 Goals, 41 Assists, 67 Points, 6.8 Point Shares. Heatley had a great start to his career but a car crash that killed a teammate necessitated a change of scenery and he would be traded to the Ottawa Senators who would later have a pair of 100 Point Seasons where he was named a First Team and Second Team All Star. He would score 791 Points in 869 Games. Unranked on Notinhalloffame.com. 3 Goals, 16 Assists, 19 Points, 5.4 Point Shares. Barret Jackman would have a good career as a stay-at-home Defenseman and his was spent with the St. Louis Blues for all but one season. Jackman never would come close to winning an individual award but the fact that the Blues held on to him for 13 seasons show what kind of asset he was. Unranked on Notinhalloffame.com. 29 Wins, 18 Losses, 9 Ties, 12.6 Point Shares. Other than his Calder trophy win, Raycroft only had one good season of note which was with the Toronto Maple Leafs three years after his Calder win. Those two years comprised well over half of Goalie Point Shares over his 11 seasons in the National Hockey League. Unranked on Notinhalloffame.com. 33 Wins, 20 Losses, 7 Ties, 11.2 Point Shares. Mason’s Calder Trophy winning season was his best year and he was also the runner-up for the Vezina and fourth place finish in Hart Trophy voting. Mason would have a 205-183-64 record. Eligible for the Hockey Hall of Fame in 2021. The following are the players who have won the NHL Calder Trophy who are still active. 52 Goals, 54 Assists, 106 Points, 12.7 Point Shares. Ovechkin was the first Washington Capital to win the Calder and he did so with a 50 Goal and 100 Point Season which is no small feat in the dead puck era. Since that win Ovechkin took the Capitals to their first Stanley Cup win in 2018 and along the way he has won seven Maurice Richard Awards, three Hart Trophies and one Art Ross. 33 Years Old, Playing for the Washington Capitals. 33 Goals, 52 Assists, 85 Points, 9.4 Point Shares. Evgeni Malkin would be the second straight Russian to win the Calder and to date he has had a spectacular career where he has been a four time All Star, a Hart Trophy winner and two time Art Ross winner. Malkin would also take the Penguins to three Stanley Cups continuing the winning tradition of the Western Pennsylvania team. 32 Years Old, Playing for the Washington Capitals. 21 Goals, 51 Assists, 72 Points, 7.2 Point Shares. Patrick Kane has to date an incredible career where he has won three Stanley Cups with the Blackhawks and was also a three time First Team All Star. He would win the Hart Trophy in 2015/16. 30 Years Old, Playing for the Chicago Blackhawks. 11 Goals, 37 Assists, 48 Points, 9.8 Point Shares. As of this writing, Tyler Myers’ rookie season was his best by far as his Goals, Assists, Points and Point Shares were all career highs. It has been a good career but not what you would hope for considering his start. 28 Years Old, Playing for the Buffalo Sabres. 31 Goals, 32 Assists, 63 Points, 8.1 Point Shares. To date Skinner has been named an All Star twice and has equaled his rookie point total in 2016/17 but has not eclipsed it. 26 Years Old, Playing for the Buffalo Sabres. 22 Goals, 30 Assists, 52 Points, 6.8 Point Shares. From Sweden, Gabirel Landeskog has performed well and went to his first All Star Game in 2019. He does have a way to go to get onto a Hockey Hall of Fame trajectory. 26 Years Old, Playing for the Colorado Avalanche. 14 Goals, 17 Assists, 31 Points, 3.3 Point Shares. Huberdeau has thus far had a good career though it has been spent exclusively in Florida and he has not been showcased much on a national level. 25 Years Old, Playing for the Florida Panthers. 24 Goals, 39 Assists, 63 Points, 3.3 Point Shares. Since his Calder Trophy win McKinnon has had two 90 Point Seasons and in 2017/18 was a Second Team All Star and the runner-up for the Hart Trophy. 23 Years Old, Playing for the Colorado Avalanche. 12 Goals, 27 Assists, 39 Points, 8.5 Point Shares. A better than you think blueliner, Ekblad finished 22ndin Norris Trophy voting as a rookie and was 16thas a sophomore. 22 Years Old, Playing for the Florida Panthers. 30 Goals, 47 Assists, 77 Points, 9.8 Point Shares. Panarin played in the KHL a little longer and did not arrive in the NHL until he was 23 making him a little older than most rookies so perhaps he had a bit of an advantage, but he was great as a rookie and he would be named a Second Team All Star in his second season. 27 Years Old, Playing for the Columbus Blue Jackets. 40 Goals, 29 Assists, 69 Points, 9.7 Point Shares. Maple Leafs fans were thrilled when Matthews scored five goals in his first game and overall in his rookie year he had a 40 Goal season that was good enough for second overall. The American was also named an All Star and he led the NHL in Even Strength Goals. 22 Years Old, Playing for the Toronto Maple Leafs. 22 Goals, 63 Assists, 85 Points, 8.2 Point Shares. Barzal finished fifth in the NHL in Assists as a rookie. 21 Years Old, Playing for the New York Islanders. From what we can see in terms of the Calder Trophy winners there are some solid Hall of Fame potential but like so many sports injuries can derail such great starts. This looks to be our favorite to monitor as we go forward. Up next we are going to back to the NFL to the Pro Bowl MVP. Kirk Buchner, "The Committee Chairman", is the owner and operator of the site. Kirk can be contacted at [email protected] .